This was our TLA Women In Tech co-founder Nikki Watkins quoted in Marketing Week recently after participating in a panel at the Festival of Marketing. A key purpose for TLA WiT, and for our Advocates, is to change the gender landscape; for women to be a forethought not an after-thought; for the opportunities out there to be on an equal footing; and for women to be able to contribute in a purposeful and valuable way to our businesses, our economy and our future. Earlier this year, TLA WiT had the honour of launching London Technology Week at the London Stock Exchange which was an exciting start to an amazing week of events designed to celebrate the work of women in the tech industry, to raise awareness of the important role that diversity plays in our thriving tech ecosystem in London, whilst challenging ingrained prejudices that are restricting greater progress. During this week, our Advocates were invited to share one action they have taken this year to shift the dial on inclusivity, and the responses were varied and inspirational. There is clear evidence that people are taking action in all areas of inclusivity – from those who are “in discussions with the Stroke Association on how we can support them with their Back to Work scheme” (Elaine Humphreys, CityFibre) to those actively hiring locally, or ensuring they have a fair representation of people from BME backgrounds. And whilst all of this is to be applauded and encouraged, TLA WiT is specifically interested in those actions which are having a direct impact on the gender landscape, and on the five key areas we believe need addressing: Boards, Best Practice, Education, Funding and Mentoring. 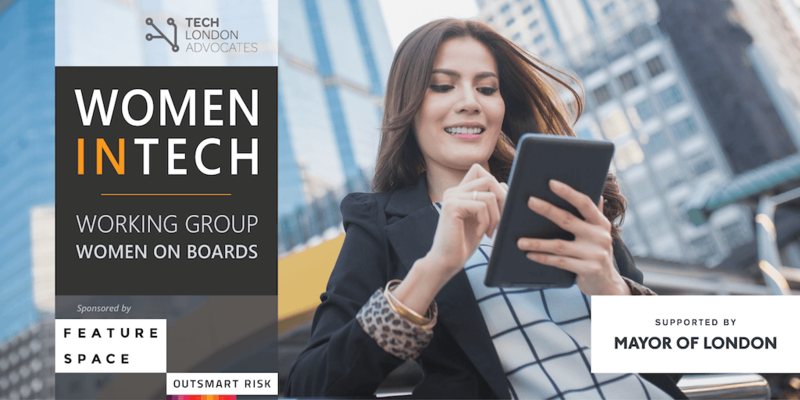 According to our Advocates, there are many women out there forming start-up boards, and more people offering women roles on boards. This is a positive sign and definitely a step in the right direction. “We’re seeing an increase in the number of leaders actively exploring a diverse leadership team or board.” (Sarah Luxford, Nexec & co-founder of TLA WiT) The inclusion of women at the top level of any company is beneficial to everyone – data shows that having women in a leadership team increases business performance by at least 15%, with a 34% higher return on investment for women-led tech companies. It is reassuring to see that change is happening in leaps and bounds when it comes to Best Practice. Some Advocates are addressing unconscious bias, e.g. by “training middle managers in recruiting for diversity” (Hilary Simpson, London Borough of Camden) and many are building in strategies to remove reference to gender or race in their recruitment drives. Others are taking a more direct approach and ensuring women are proportionately represented, for example by “pushing for minimum numbers of female CVs for consideration in engineering roles” (Rosalind Singleton, UK Broadband) or making sure “our hiring pipeline had 1:1 gender balance for the shortlist in tech roles” (Sanskriti Dawle, Project Mudra). There are many Advocates who are tackling the gender imbalance in Tech right at source, both by impacting what education is available for girls and women, and by ensuring girls are properly introduced to the possibilities and opportunities available for them in the Tech world. Stemettes, for example, “hosted ‘Girls in STEM’ back in January which saw 1,800 girls attend across five locations in the UK and Ireland. The girls, aged 11 – 15, tried their hand at coding, attended workshops and heard from inspirational speakers from the STEM sector.” (Charlotte Pascual, Stemettes). Meanwhile, Founders4schools “which helps teachers increase students’ employability, has launched, and continues to promote, a tool that brings more women leaders in schools to inspire more young girls and help them see that leadership roles are not out of reach.” (Iria Pizania, Founders4Schools). They’re not the only ones going into schools: the BT Group, for example, have been “taking female engineers into schools to encourage more applications for female apprentices.” (Andrew Campling, BT Group). A gender balanced future in Tech can only happen if we ensure young girls know that this is a suitable, possible and desirable career path for them. Statistics indicate that 12% more revenue is generated by venture backed women-owned Tech companies than their male counterparts, and yet only 9% of venture capital goes to women-led companies. According to the Centre for Entrepreneurs women-led small and medium-sized enterprises already add £70 billion to the UK economy. It is good to see, therefore, that there are Advocates out there championing women in tech and funding female entrepreneurs and innovators. Paulina Sygulska Tenner from GrantTree for example, has been shifting the dial by “raising £35m (over 5 years) worth of equity free funding for tech.” And Janet Coyle from London and Partners has been “creating and driving Female Founders Scale up and SVC2UK initiatives” which is key to stimulating economic growth in the UK. A huge percentage of our Advocates are trying to shift the gender inclusivity dial by mentoring women and girls, such as “female entrepreneurs” (Leonardo Zangrando, Learning Startup) and “Girls in Tech” (Pat Saini, Penningtons Manches LLP). Sharing your expertise and experience in this way is not only wonderful to see but also incredibly impactful. Whole company approaches are on the increase too. Companies such as LinkedIn who have a major programme developing their women from sales and engineering, including development workshops (run by our very own Nikki Watkins) and full mentor/sponsor programme which matches senior leaders to these women for a whole year. Every action, and every shift of the dial, counts. From the big: “I set up the Women’s Equality Party and ran for Mayor of London to highlight the needs of the city’s 4 million women” (Sophie Walker, Women’s Equality Party), to the small: “I have lunch with every new female recruit and talk about how they can assert themselves in a male dominated office” (Shafie Roudie, Public Affairs and Communication), it all makes a difference. It’s been so rewarding to read the comments and know that so many people are doing so much, and feeling as passionate about it as we do. What are you doing to impact the gender landscape, to shift the dial on inclusivity, and to create awareness and drive forward change? Share your stories with us by tweeting @tlawomenintech. It all matters, because we all matter.